A winter work party at Holtspur Bottom with bonfire burning scrub. If you visit the reserve between September and February, you may be lucky to see a few butterflies on sunny days, but after the end of September, you may well see none at all. However, even without butterflies, the scenery is still wonderful, and you are welcome to come to enjoy the peace and tranquility our reserve offers. 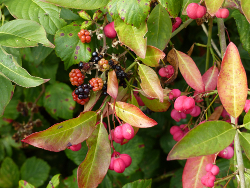 In Autumn, the hedgerows are full of colourful berries of the Spindle and Wayfaring trees, as well as Rose hips, Hawthorn berries, and Sloes. Autumn is the time we normally cut the meadows (see How we manage the reserve for more information on why), and it is when you may see sheep grazing the reserve. Winter is traditionally the time when our volunteers do the bulk of our conservation work, preparing the reserve for the following season. 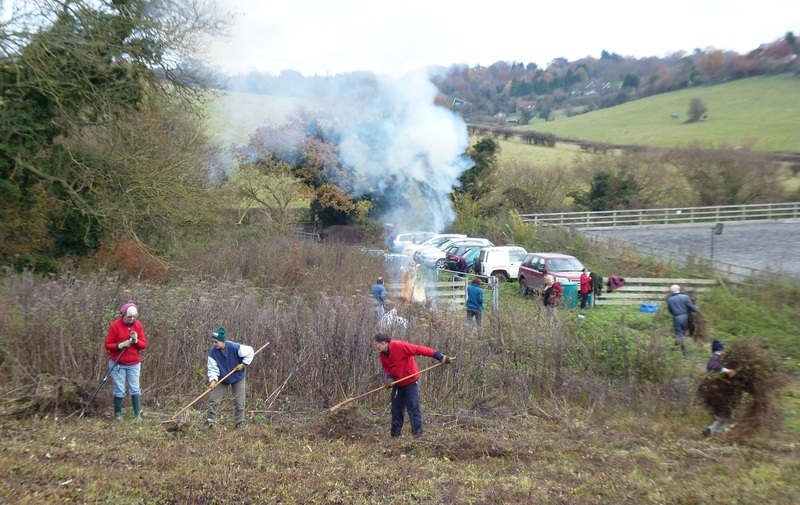 If you would like to help us care for Holtspur Bottom, why not join us on one of our work parties? We're a friendly group, and you could help us to make a real difference to this special place. No previous experience is needed, as full instructions and tools are supplied. You can find the dates of our scheduled work parties on our main Branch web site.